Another week, another Major Cycleway consultation, it really is all on at the moment. The latest cycleway to be unveiled takes us north of the city – and it’s quite a large one to consider, with a variety of different cycleway treatments along the way. 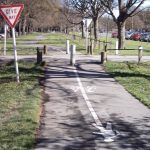 The Papanui Parallel cycleway provides a safe cycling option all the way from town through Edgeware and St Albans before ending up in Papanui. All up, the route is 4.9km long and the entire length (save for the already completed Grassmere-Rutland pathway) is now out for consultation. OK, let’s work our way from the top slowly into town. The route starts at the Railway Cycleway crossing of Sawyers Arms Rd and travels down this street towards Main North Rd via a two-way separated cycleway on the south side (with car-parking removed on one side to make space). It’s not clear the exact width of the cycleway, although the plans would suggest 3.5-4.0m. New traffic signals at Sisson Drive help manage getting across this busy entrance to Northlands. 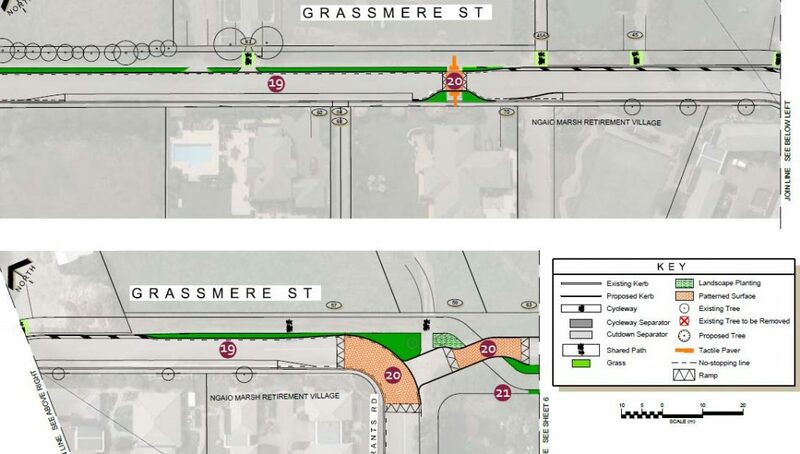 At the Main North Rd intersection, things get a bit tricky to provide a connection over to Grassmere St. Two possible options are proposed to get around the local shops in the area whilst still providing some on-street car parking (not sure if any bike parking is provided?). The one that retains the most parking (seven adjacent spaces, although there is more on the other side of Main North Rd) provides a shared walking/biking space around the corner that really doesn’t suit a busy retail area. The alternative, which keeps only three spaces (although personally I think they could squeeze in four) continues to have a kerb separated cycleway to minimise pedestrian conflicts. Both options then lead to a signalised crossing over to Grassmere St as well as providing a handy little connection into the front entrance of Northlands Mall. Along Grassmere St, again a two-way cycleway (now on the north side) provides the link to the new shared pathway to Rutland St, with on-street parking removed on one side to fit this in. Further along, as the roadway narrows, this becomes a 4m-wide shared path. But, if you really didn’t want to deal with pedestrians, the street itself is reasonably quiet to ride on anyway (and will be slowed further with the introduction of regular raised platforms). Once on Rutland St, the cycleway now switches to one-way separated cycleways on each side of the street. These will be about 2.2m wide on each side, to allow for overtaking or riding side-by-side with others. Again, parking will be removed on one side of the street to accommodate all this. There are even spaces being provided for putting your wheelie bins out by the parking so that the rubbish trucks can reach them (where there is no parking, the trucks can reach over the cycleway to the footpath). Side road treatments are an interesting case study along the cycleway. The general approach is to raise the cycleways up onto platforms crossing the side road entrances, thus forcing any crossing vehicles to go slowly. The consultation documents note that “straight-through cyclists will have right of way over vehicles at the side roads” – technically the law is actually somewhat ambiguous on this matter currently, but that is being rectified, and practically speaking the design should work well. 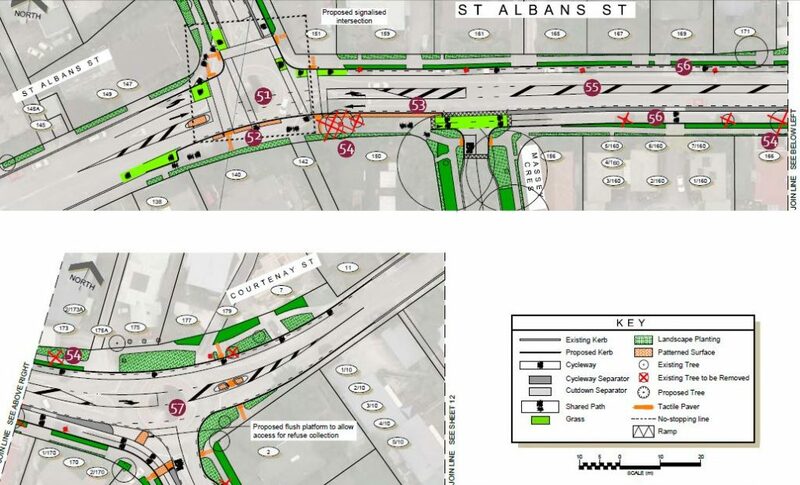 Major intersections have been thought through, with an upgrade of the Innes/Rutland intersection and a new signalised intersection at Rutland/St Albans. There will be a dedicated signal phase for pedestrians and bikes before general traffic to avoid conflicts with turning traffic. At Innes Rd there are also hook turn boxes to allow for right-turners. On-street car parking is always a big issue with projects like this, especially around shopping areas. One of the areas being looked at are the Rutland St shops near Malvern St and Hawkesbury Ave (which also gets a lot of parking pressure from nearby Rugby Park). 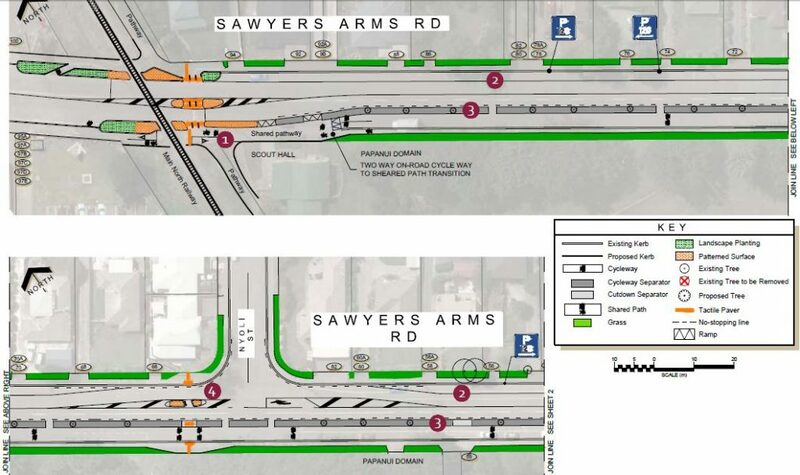 One option proposed is to close off the Hawkesbury Ave intersection to motor traffic, thus allowing more parking to be maintained in front of the closed off street (although I notice that they haven’t provided a connection to southbound riders once you are out of the side street). Perhaps if some of those wheelie bin platforms were “part-time” ones they could squeak in another precious parking spot? South of Rutland St, the cycleway reverts to a 3m-wide two-way separated cycleway on the south-west side of St Albans St and around into Trafalgar Ave. For those eastbound riders continuing on to Courtenay St, an on-road cycle lane is also retained. All on-street parking has removed along this section to fit things in, but I think they probably could fit some in if they played around with berms or got rid of some of the painted median. South of Massey Cres, Trafalgar St becomes a neighbourhood greenway to accommodate cycling on-street. To reduce the amount of traffic along this route (which is used as a bit of a rat-run), a mid-block street closure is proposed just north of Dover St. Trafalgar St has some existing speed bumps, and is narrower than the neighbourhood greenway route used as part of the Rapanui – Shag Rock Cycleway, but nothing else is planned to reduce speeds along this section – not even a 30km/h speed limit is mentioned. The Trafalgar St greenway then takes riders to Edgeware Rd and through the Edgeware shopping village to Colombo St. This area is the subject of a Suburban Masterplan, which proposes “an attractive and compact centre, high quality locally-owned shops and restaurants, and safe, high amenity, pedestrian-focused streets”. Interestingly, the Masterplan envisages a textured road surface in this area, but nothing is shown here (a 30km/h speed limit would make sense too). I’m also not entirely convinced about the 3-5m wide shared path around the shop frontages (the large radius kerbs don’t help provide much off-road space either). Finally the route continues down Colombo St via 2m wide one-way separated cycleways all the way down to Bealey Ave (with parking removed on one side). Again, raised platforms are used to treat crossings of side-roads. At bus stops, raised platforms are also used to bring riders up to footpath level to allow passengers to easily board and disembark. At Bealey Ave a separated signal phase will get cyclists across the main road before turning traffic gets to go. I do wonder why through-traffic on Colombo isn’t blocked at the intersection, as is being done at Worcester/Fitzgerald on the Rapanui – Shag Rock cycleway (it would require relocating the bus route to a parallel street though). Once over the Bealey Ave intersection, the route becomes part of the Accessible City Plan being delivered separately. The loss of parking and trees, and the general layout of the planned cycleways along Rutland St has seen an anonymous flyer doing the rounds of the affected neighbourhoods. All manner of sins are predicted to occur if the project goes ahead (short of the four horsemen of the apocalypse appearing…), including “more crime”, “mental health decline”, and “conflict amongst neighbours” (I’ve got no parking for 50m either side of my house and we get on fine with our neighbours…). 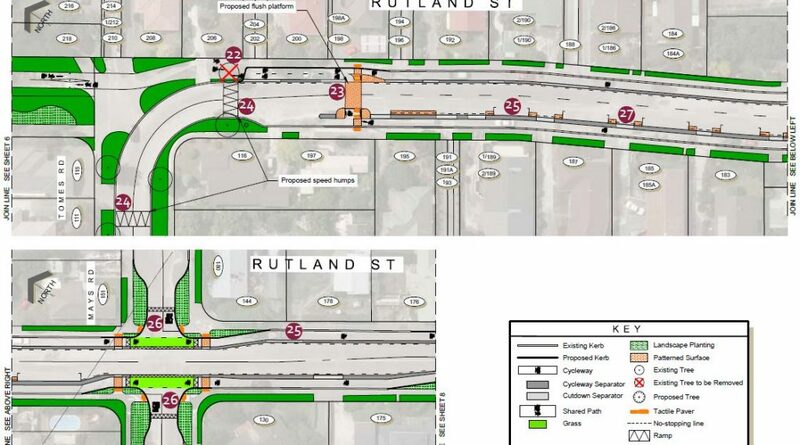 The suggested solutions in the flyer are to push the cycle lanes onto Papanui Rd and Cranford St instead; interestingly, reduced neighbourhood speed limits are also mooted – no argument there… Personally, I can see plenty of garages and driveways at most houses along here, so I don’t think many people will be very deprived. And I would suggest that a number of new trees could be planted in between (or in place of) many of the parking spaces. The constrictions in space at Edgeware village, coupled with reductions in existing on-street parking, have also made some people grumpy. 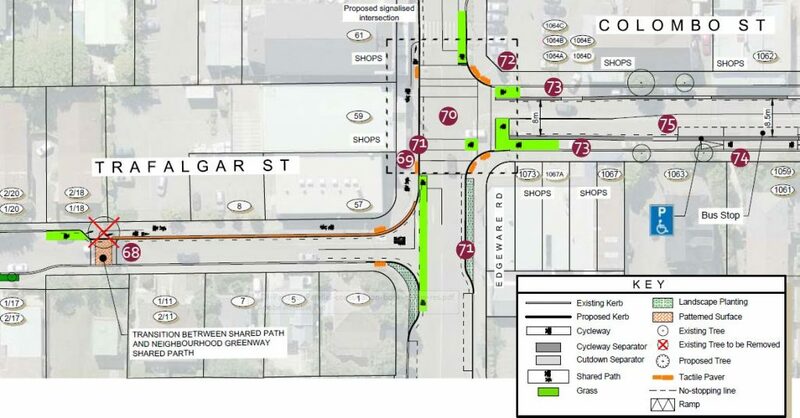 There has been a suggestion to run the cycleway down Caledonian Rd instead and then hop back over to Colombo St further south (UPDATE: an alternative plan showing this option is now available). This somewhat neglects the fact that people on bikes also want to access the Edgeware village. As alluded to above, I think the Colombo/Trafalgar intersections at the village could be better configured to provide for walking, cycling and parking anyway – for a start there’s still a lot of width being allocated to traffic lanes. Submissions for this project now close at 5pm Mon 14th Dec (Note new date), so Have Your Say; I suspect that there could be a lot of feedback from aggrieved locals, so it would be good to have some balancing support from those who can see the benefits (here’s some of them…). If you want to know more, you can also go along to the information session at Paparoa St School on Mon 23rd Nov between 4.00-6.30pm (there will be a presentation at 5pm) – UPDATE: additional meetings now scheduled for Thu 3rd/Fri 4th Dec. Spokes Canterbury have also provided some useful submission feedback for this and the Rapanui – Shag Rock Cycleway project, so check out their advice. 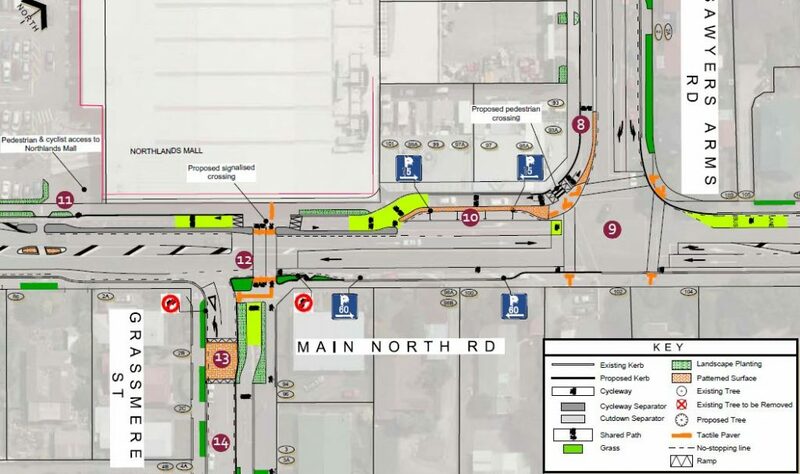 What do you think of the Papanui Parallel Cycleway project? Submitted. I hope the council will receive overwhelming support for this and other cycle ways. Safe cycling facilities should have priority over car parks, they are not called parking ways are they? I’d love to know how a cycleway would create ‘more crime’ and ‘mental health decline’…. I’m liking the new alternative along Caledonian Rd, but reverting back to Colombo St at Purchas St seems a bit silly. Why not continue to Bealey Ave and create a staggered signalised crossing using the central median! According to the CCC engineers talking at one of the public consultation meetings this route was considered ( using Carrington St , rather than Jacobs ) . It did not make the cut due to the fact that it is not sufficiently direct for those using the cycleway to commute. Crossing Innes Road is also another problem, in that having a second light controlled intersection so close to the Rutland Street lights will seriously delay the busy commuter traffic heading east/west along Innes Road. At Rutland St the phase will allow cycles and Rutland straight through traffic to travel concurrently.